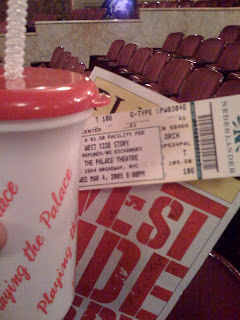 My boss was kind enough to send me and a friend, (I chose Pony Express) to see the revival of West Side Story. I am endlessly glad that I went. I could tell you about the things that made me weep with delight, I could tell you about the things that made steam incinerate my eardrums, I could tell you about that ticket there in the photo which grazed my dry-air-ravaged skin so lightly that I nearly bled out before the first curtain. You know what, though? It's almost midnight and I have to go to work tomorrow and get a lot of stuff done so we don't have time for that. I've only got time to point out the object to the left. The sippy cup. Yup, that's the technical term. We approached the bar on our way in and acknowledged the sign that disallowed "outside beverages." Pony Express asked an usher if we might purchase a beverage at the bar, an "inside beverage" if you will, and bring that inside. The usher replied that we could indeed with one proviso. It had to be in a sippy cup. So tonight I sat in a seat that, purchased for charity, cost the same amount as a pair of Jimmy Choo sandals; I watched a revival of one of the great, classic American musical; and I drank champagne out of a sippy cup. Life is sweet, albeit a little disturbing. I was okay until you said that you were drinking CHAMPAGNE out of a sippy cup. Soda? Fine. Champagne, though? That's just weird. I love this batshit crazy life!!! Sippy Champagne! In the olden days, the urban myth was that one would get drunk really fast if one drank beer out of a straw. . .
doesn't mix too well with a fancy schmancy broadway show though. SO Glad you had a great night! is mornings like this that I don't comprehend your lack of caffene...atta girl. Why would you drink soda at a theater? Zelda, you'll be happy to know that the Jr. Mints consumed during Act I seemed to have magical hangover dissolving properties. After two glasses of wine, some apps, 2 sippy cups of champagne, a box of Jr. Mints and half a coconut dream bar I should still be lying on my bathroom floor praying for death. I'm not, though, not even an achy head, I feel great! I was a little sorry not to have caffeine this morning, though. Not a lot of sleep. You would think some entrepreneurial type would invent a perfect wine glass suitable for theatre concessions.....hell, I'm in the event business, I ought to! I think you're on to something g! I know of at least one theatre here in NYC that already needs you.